Da Capo Press, 9780306819216, 240pp. Lovers of the printed book, arise Thirty of today's top writers are here to tell you you're not alone. In Bound to Last, an amazing array of authors comes to the passionate defense of the printed book with spirited, never-before-published essays celebrating the hardcover or paperback they hold most dear--not necessarily because of its contents, but because of its significance as a one-of-a-kind, irreplaceable object. Whether focusing on the circumstances behind how a particular book was acquired, or how it has become forever "bound up" with a specific person, time, or place, each piece collected here confirms--poignantly, delightfully, irrefutably--that every book tells a story far beyond the one found within its pages. 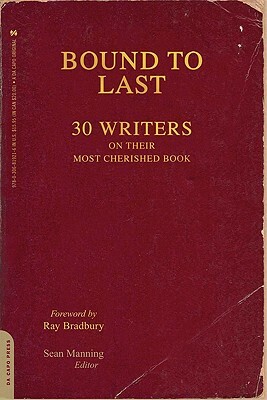 In addition to a foreword by Ray Bradbury, Bound to Last features original contributions by: Chris Abani, Rabih Alameddine, Anthony Doerr, Louis Ferrante, Nick Flynn, Karen Joy Fowler, Julia Glass, Karen Green, David Hajdu, Terrence Holt, Jim Knipfel, Shahriar Mandanipour, Sarah Manguso, Sean Manning, Joyce Maynard, Philipp Meyer, Jonathan Miles, Sigrid Nunez, Ed Park, Victoria Patterson, Francine Prose, Michael Ruhlman, Elissa Schappell, Christine Schutt, Jim Shepard, Susan Straight, J. Courtney Sullivan, Anthony Swofford, Danielle Trussoni, and Xu Xiaobin. Sean Manning is the author of The Things That Need Doing: A Memoir and editor of the nonfiction anthologies Top of the Order, The Show I'll Never Forget, and Rock and Roll Cage Match. He lives in New York.